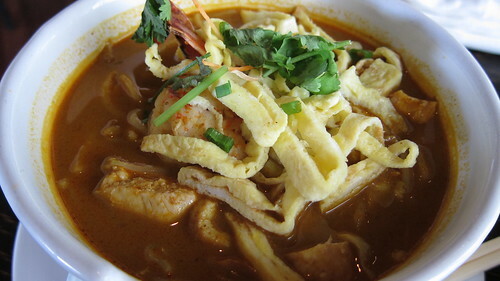 laksa | eat. drink. cook. travel. Seems like a famous chef who used to work at Chatterbox moved to the Teochew Club near Newton and started cooking up his own version of chicken rice and other local dishes. It was of course the signature chicken rice that brought us here. It was good! 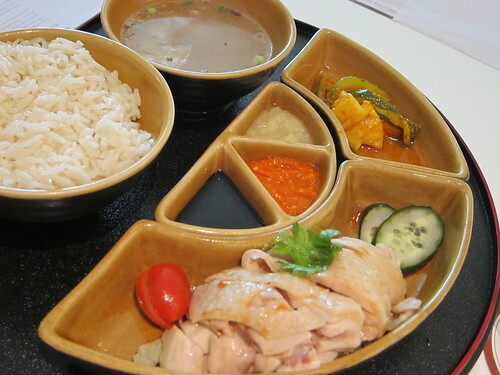 Check out the full complement of accompaniments with the chicken – slightly upgraded cherry tomato and japanese cucumber from the local versions, soup that had slightly less msg than the hawker centre norm, the usual trio of sauces and something surprising, achar. The chicken was very well done as not just the thigh parts were tender (that’s simply expected), the breast parts were too! The chilli sauce was just the right balance of spicy and salty with a touch of vinegar and the ginger sauce was good enough. Even though my default is not for black sauce, I quite liked this version as it was thick and not too sweet. But what I liked best was the rice itself. 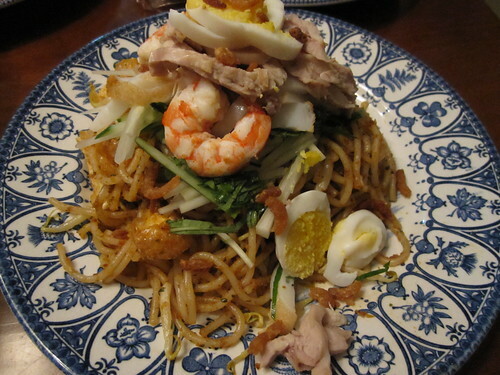 It was incredibly fragrant, and not just from the typical ginger, shallot and garlic, but from pandan as well. 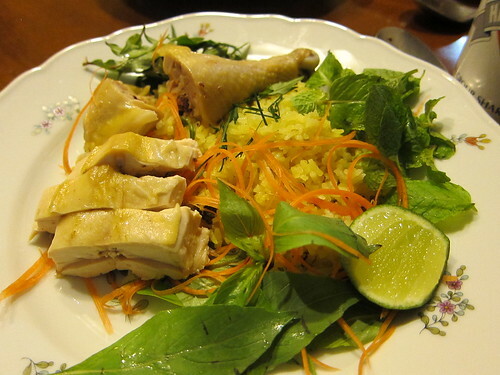 It was so good that we asked our white rice for the other dishes to be changed to chicken rice. 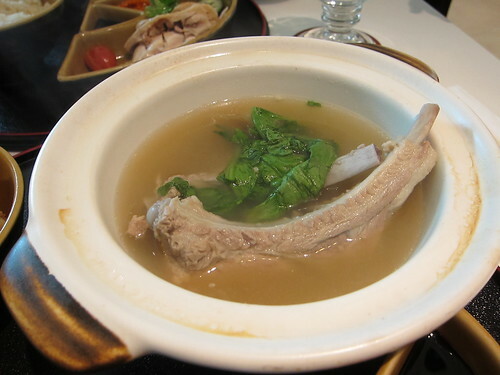 We also had the bak kut teh, which was surprisingly for a Teochew club, the Hokkien version. It was very slightly herbal and the herbs sat back for the garlic and pork flavours to shine through. Good stuff, especially with the chicken rice. 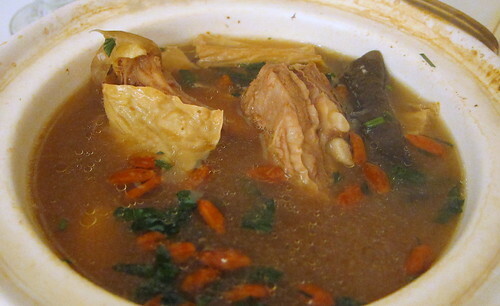 … and the mutton stew which had excellent chilli sauce with plenty of chincalok in the mix. 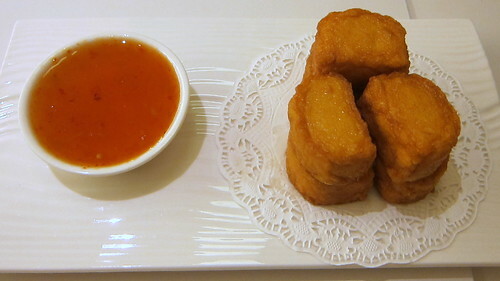 The home made tofu is not bad too, it’s a cross between tofu and fish cake, like ultra firm tofu with a fishy flavour. Worth a try. Just don’t order the char kway teow. It lacked wok hei and was pretty much a jumble of soggy noodles. Bottomline: come here for the chicken rice and try a few other dishes, just not the char kway teow. After six days of doing nothing but diving, eating and sleeping, it was time to take a break from the stresses of it all and unwind at a nice resort. 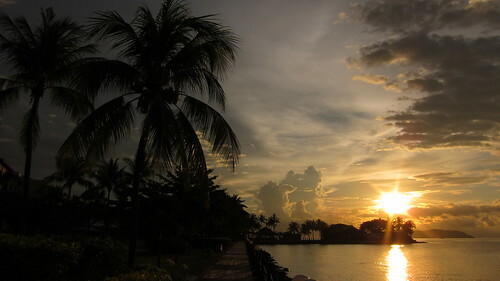 We checked in at the Shangri-la Tanjung Aru Resort to relax and wash our gear. Yes, you saw it right, we like to unwind in a place where we can wash and dry our gear in peace so that we don’t have to deal with it when we get home. It’s nice to really chill out and do nothing while waiting for our wet suits to dry. 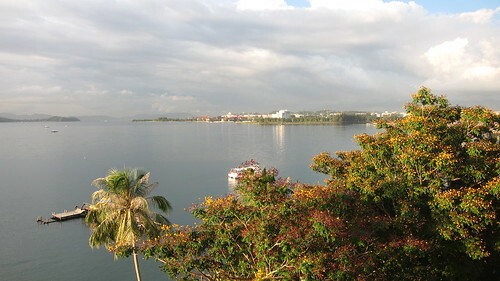 Here’s the lovely view of the bay from our room. We had very decent weather the whole time, with hot, clear days (ideal for drying our stuff) and clouds rolling in only in the evenings. 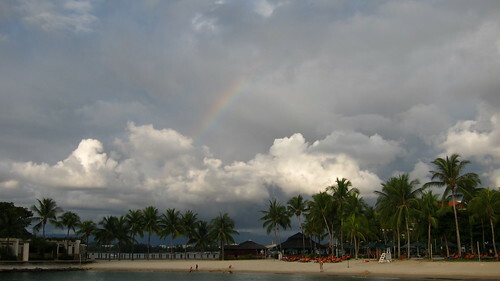 It was lovely how a rainbow hovered over the resort just as we were strolling round checking out places to eat. There were two casual dining places at the resort, one was al fresco and only served barbecues, and the other was the cafe where the sumptuous buffet breakfast was served. Lunch here was pretty decent too, with a good selection of western and local favourites. My Sarawak laksa was very decent. 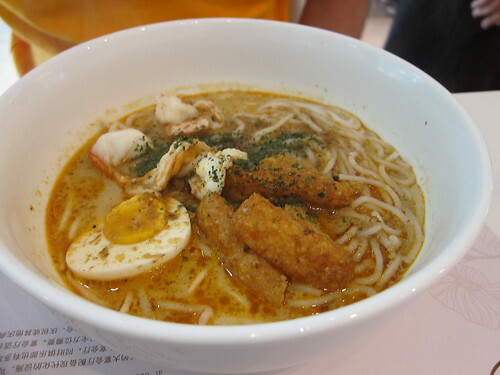 Not having been to Sarawak, I wouldn’t know whether it was authentic or not, but I enjoyed what tasted like a cross between curry and mee soto. A winner in my books! 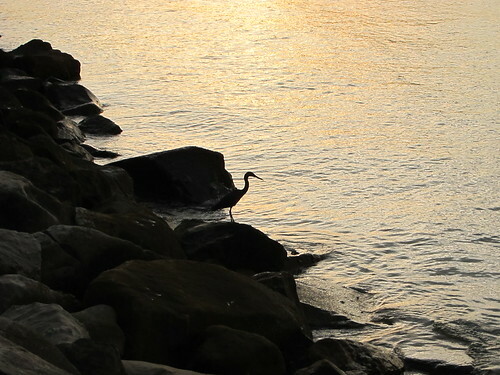 … as did this wader looking out for fish. 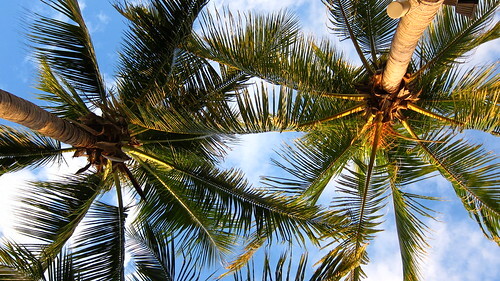 We sat under some coconut trees for happy hour drinks, waiting for sunset to arrive. It was lovely to put up our feet and sip our cocktails. Post-cocktail shishas and more drinks didn’t hurt either! It was fun messing about blowing out vanilla-scented smoke through our nostrils. No incriminating pictures here though, sorry! What a lovely end to our holiday. I ran out of gas yesterday. Even though the new cylinder came very promptly, I challenged myself to make lunch without using the gas stove. I had a rather odd bunch of stuff in the house. First, there was some potato to finish before they started sprouting. There was some defrosted chicken thigh, skin on. In the veg department, there was some curly red lettuce crying out to be used, mint leaves, laksa leaves and some leftover celery. I also had some pear and leftover lemon wedges in the fridge. It all came together in the form of roast potato in laksa and mint salsa verde, baked chicken and a green salad with celeary and pear. It was light yet satisfying and great for fine sunny weather that threatened to turn cloudy. Try this all together or take it apart to assemble your own version. Scrub the potato thoroughly and slice thickly. Peel the potato if you like but I never bother. Grill the slices on both sides till slightly browned. Remove and then preheat oven to 150ºC. Chop the mint and laksa leaves finely, add a good pinch of sea salt and then mix with the oil. Smear generously onto potato slices. Put into the oven together with the chicken (and skin) and bake for 15 minutes till the chicken is cooked and the skin crispy. For one person. Easily scaled up. Cut the celery into long, fine diagonals and the pear into fine matchsticks. Tear the lettuce into small pieces. Put celery, pear, lettuce and mint into a large bowl. Squeeze over half of the lemon, then pour over the oil and add a good pinch of salt and a generous grinding of pepper. Using clean hands (use spoons if you’re squeamish), toss the salad until mixed well. Taste and add a bit more lemon juice or salt and pepper if necessary. For one greedy person or 2-3 non-salady people. I’m going through a laksa leaf craze now and am trying different ways to use it that’s different from the typical laksa lemak dishes. I’ve been wanting to make an oil-free Eastern salad and this came together. If you can’t find laksa leaves, you can use a soft leafy herb like mint or basil. 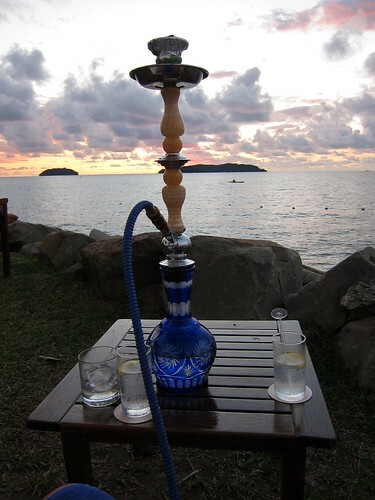 Replace the jambu with apple if you can’t find that either. Add extra lemongrass if you can’t find torch ginger. The most important thing about this salad is that all ingredients, especially the herbs, must be absolutely fresh. I made this a few days late as I wasn’t able to cook on schedule, and the laksa and torch ginger weren’t as fragrant as I like. Read my blog, learn from my mistakes! In a large bowl, combine the chilli, jambu and tomatoes with the lime juice and fish sauce. Set aside for the flavours to mingle and get on with the chopping for the other ingredients. Add the lemongrass, torch ginger and lettuce, tossing gently. Taste and adjust seasoning by adding more lime juice or fish sauce. Add some sugar if needed. Just before serving, sprinkle over the ground peanuts. Mykii is one of those places that got my attention as I surfed hungrygowhere. It was so much in the collective food lovers’ consciousness that my foodie friend and I both had the place in mind when we agreed on a lunch place. Plus, it had taken over the space formerly occupied by the Holland Village branch of Marmalade Pantry. Had to be good, right? We went for the set lunch at $16.80++ that included soup of the day, choice of main and coffee/tea. First up was the soup. The odd thing was that the server told us that the soup was pumpkin soup but later served us mushroom instead. She told us that there was still mushroom soup left (!) as she set down our soup dishes. How bizarre. No matter, there was nothing to fault with the soup. It was earthy and thickened with lots of mushroom bits. The drizzle of cream on top was a nice touch. I liked it. I chose the seafood linguine with laksa pesto and was a tad surprised to see it coming in a sizzling Korean-style stone pot. It was stupendously disappointing. First, the sizzling pot burnt the bottom bits of the pasta. Yes, burnt, as in charred to a (not-nice) crisp. Next, the pasta was certainly not al dente; it was the localised soft version. The prawns and squid were alright, overcooked in parts from contact with the sizzling pot. The worst thing about it was the “pesto” that certainly wasn’t. It was simply non-spicy laksa paste, nothing special. The only reason why this dish just about qualifies as fusion is that they used linguine and presented it in a Korean pot. This is a prime example of having my food messed about with in name and conception. First, I can’t imagine why the restaurant thought to name it as pesto as there really isn’t much pesto-nature to this dish. It was particularly jarring because I’d only just been doing a series on pesto and had been musing about what pesto was and wasn’t. The name should be changed to something along the lines of “sizzling laksa linguine.” Next, the stone pot was such a bad idea causing so much to go wrong with the dish. (Note also how it made the coriander garnish wilt. Ugh.) I can’t fathom what the chef was thinking. Even though the dish was blah and OK rather than inedible, this was an unqualified FAIL because it hit exactly on my pet peeve that food should not be messed about with. I didn’t finish it, plenty shocking because in some circles I’m also known as The Hoover. My friend had the panini with beef bulgogi but I was too despondent about my food to take a photo or ask her how it was. The saving grace was that we ended the meal with good strong un-wimpy coffee. Conclusion? I might possibly be enticed back to try out other stuff if you pay me for it.